A tornado-strength storm in Sydney, flooding in Geelong and devastating bushfires in Western Australia and Victoria have reminded us once again how exposed we are to natural disasters in our wide brown land. Our geography has the capacity to deliver destructive floods, bushfires, severe storms, tropical cyclones and even earthquakes. While we can’t control the weather, we can take steps to reduce our risk, including making sure we have adequate home insurance cover. There are two main types of home insurance policies: home building cover and contents cover. A home building policy covers the actual structure of your house and other permanent structures, such as fences, garages, sheds and in-ground swimming pools. A contents policy covers items you have in your home, garage, shed etc. Most insurers offer combined home building and contents policies but it is possible to take each out separately if required. Natural disasters – often referred to as natural perils – are usually covered by home insurance policies, but there can be exceptions and definitions can vary. It’s a myth that insurers do not cover acts of God. Firstly, the term ‘act of God’ is not likely to appear in any insurance policy and secondly, acts of God usually refer to natural disasters, which are indeed frequently covered. Regardless of the terminology, it’s important you always read the policy disclosure statement (PDS) to understand what is and isn’t covered by that particular insurance policy. You can find a copy of the PDS on an insurer’s website, and you should always read it before taking out cover. Floods have proven particularly contentious for insurers and policyholders, so much so that the Federal Government introduced a standard flood definition in 2012 to avoid much of the confusion and backlash that followed the devastating 2011 Queensland floods. Most home insurance policies today include flood cover but there can be exceptions, so check your property’s flood risk and what is and isn’t covered before you take out a particular policy. While many consumers may consider insurance a grudge purchase, it’s actually designed to be a community product. It works on the basis that a lot of us contribute an amount of money that reflects our exposure to various risks. That money forms a large pool, which shares and spreads our risk, so that one or some of us can access a portion of that money if something goes wrong. Like other insurance products, home insurance premiums are based on risk factors, and can vary widely. The age of your home, the cost to rebuild it, location, building materials, and your property’s exposure to natural disasters are all factors that contribute to the cost of your home insurance. How much an insurer spreads various risks across policyholders is up to them. The weighting, or value, of each risk factor also differs among insurers, which is another reason why premiums vary widely and why it pays to shop around. HOW MUCH COVER DO I NEED FOR MY HOME? The Insurance Council of Australia estimates four out of five of us have insufficient insurance cover to fully recover financially if we were to lose our home and contents1. The amount you insure your home for is known as the sum insured. Most insurers ask you to nominate a sum insured, and it’s important you get this right or you may find yourself out of pocket if disaster strikes. 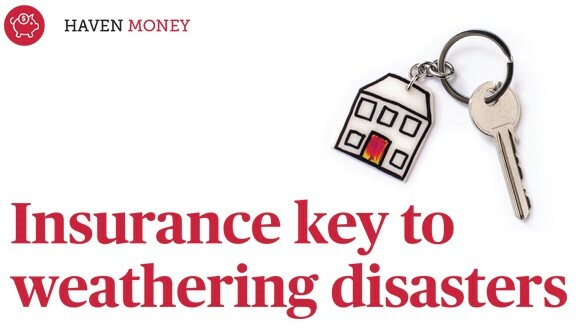 There are plenty of home insurance calculators available online to help. The main thing to remember is that your home building sum insured should be sufficient to build your home again if you had to at today’s prices. Your sum insured does not include your land, just your home itself, and is not the amount you owe on your mortgage. When calculating your entire rebuilding cost, take into account all fixed items, such as built-in wardrobes, kitchen and bathroom cabinets, tapware, light fittings, fixed awnings, fencing, garages and sheds, in-ground pools, ponds and fixed pumps. A good rule of thumb is to include anything you wouldn’t generally pack up and take if you moved. Check with your insurer if unclear whether an item comes under home building or contents. Some insurers do the math for you and offer total replacement building policies. They assess what it would cost to build your home today and charge an appropriate premium. You also need to assess the value of your contents, working out what it would cost to replace them at today’s prices. Households often underestimate how much stuff they own. In addition to big-ticket items, such as furniture, white goods and televisions, consider clothing, toys, sports gear, appliances, linen and tools. Renters often overlook contents insurance, especially if part of a shared household. Many insurers have recognised this gap and now offer specific renter policies. If your house is damaged or lost due to a natural disaster, your insurance will be what helps you back on your feet. While it’s always a good idea to keep your certificate of insurance safe, you generally don’t need it to make a claim. As long as you know which company insures your home, your name, address and date of birth will be sufficient to find you in the system. Australian insurers are well geared for disasters but a major event will strain claims services. Contact your insurer as soon as possible so they can start processing your claim and provide emergency help. Most insurers make cash or retail vouchers available for food, water and clothing, and provide temporary accommodation. They can also offer advice on what to do with damaged items or organise emergency make-safe repairs. If your roof is damaged, you should also contact your State Emergency Service to see if they can provide an emergency tarpaulin. Take photos of damaged property and contents, especially if you have to dispose of items before the insurance assessor can head out. Once you lodge your claim, your insurer will provide a claim number and put you in the hands of a specialist claims team to assess the level of damage and manage repairs. If your home is lost or damaged beyond repair, the insurer will organise a payout based on your sum insured or total replacement value, depending on your type of policy. The payout will be less your excess. In the event of a wide-scale natural disaster, builders and tradespeople will be in high demand, which may delay the repair and rebuilding process. Just remember, it’s in the insurer’s interest as much as yours to get your claim settled as soon as possible. Talk to your insurer if you are frustrated by timeframes or not happy with the service provided. You will be better off with insurance than without it in the event of a natural disaster. 1. Ask me about insurance. As well as my extensive relationships with finance providers, I also have contacts within the insurance industry I am happy to put you in touch with. 2. Shop around each year to see if you can get a better price and don’t be afraid to ask for an extra discount from your current insurer if you find a better deal elsewhere. 3. Increase your excess to lower your premium. Most insurers let you nominate a home insurance excess (the fee you pay to make a claim). The higher your excess, the lower your premium. Just be aware a high excess may reduce your ability to make smaller claims if needed. 4. Bundle all of your policies with one insurer. Insurers like to reward loyalty. If you have a combined home building and contents policy with one insurer, find out how much you will save if you switch your car over, along with any policies for a boat, caravan or investment property. 5. Make your home more secure. Home security won’t make a difference in the event of a disaster but it will help you save on your insurance. Back-to-base alarms, key-lock windows and deadlocks on doors should all help knock dollars off your premium, while deterring thieves. 6. Pay up front. If you pay by the month, you may be paying more. Check with your insurer if they charge extra for monthly instalments and see if you can adjust your finances to pay annually.